I was standing guard at the bench; three, maybe four pumpkins were lined up in a row. I had my eye out on them. After digging through piles of deformed, warted, green pumpkins, my Dad and I had narrowed it down to a handful of perfectly orange, round gems. You see, ever since I was a little girl, he and I would make the trip out to the country and hit as many pumpkin patches as were around. Fast forward twenty-six years later, and you can still find us trekking out of the city and into the land of hayrides, caramel apples, cider donuts and scarecrows. Of course, I'm no longer a hyperactive little pig-tailed blondie running around in the corn maze, and he is no longer holding my hand through the haunted houses, but I'd like to think that it's pretty cool we still do this. Alas, I revert to a little kid in these moments (after all, I still am my father's child). As I stand on the outskirts of the patch hovering closely to the pumpkins we liked, I hear a little boy scream "Daddy, I want that one!" He pointed to my pumpkin. Oh no he didn't, I thought to myself. His dad nodded to him. "Yeah, that's a great one! Why don't you go get a better look at it?" The kid ran over and tried yanking the pumpkin off of the bench, totally unscathed by the fact that I stood over them. "We are kind of holding on to these," I say to his Dad, who frankly could care less and is marching right over as if he were on a pumpkin recon mission. "Well, are they purchased?" he scoffs. "No," I reply, getting annoyed, "but we're going to." I put my hands on my two favorites as to mark my territory. He walks over and picks up one of the pumpkins on the bench. If looks could kill, that man would be toast. Because while I am now a patient, level headed adult, in this moment, I was still that little girl in her overalls and pigtails. I was an eight-year-old watching a grown man steal my pumpkin. And I wasn't having it. "These are actually ours to buy," I say, a little more sure of myself. "You can have what's left." I motion to the rest of the pumpkins we were inspecting, grab ours, and run over to the safety of my own dad. "All set?" he asks. Yeah. We're all good here. 1. Preheat the oven to 425 degrees F. To make the filling, mix the pumpkin, flour, brown sugar, nutmeg, cinnamon, and salt together with an electric mixer on medium speed until smooth, scraping the sides of the bowl well. Add the heavy cream and maple syrup, scraping the bowl several times while mixing. Mix in the beaten eggs. 2. Pour the filling mixture into the pie shell, and bake for 15 minutes. Then lower the oven temperature to 350 degrees F and bake until the filling is almost firm, about 30 minutes. 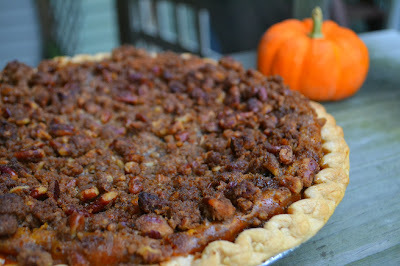 Remove the pie from the oven and sprinkle the pecan streusel over the top, covering the pie completely. Return the pie to the oven and bake until the filling is just a bit wobbly in the middle and the pecan streusel is golden, 10 to 15 minutes. The total baking time should be 55 to 60 minutes. Cool the pie on a wire rack and serve with vanilla ice cream.